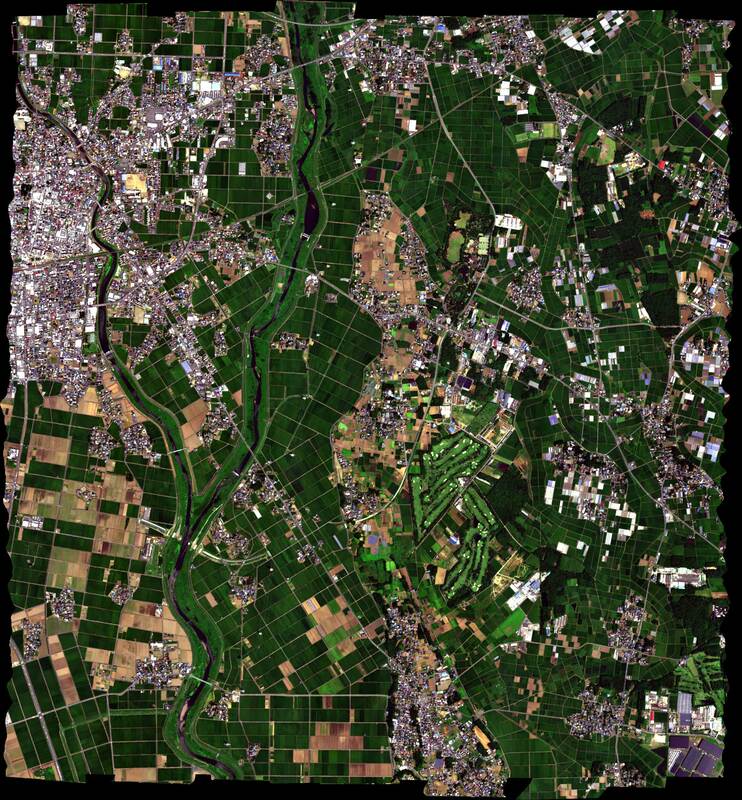 The airborne hyperspectral dataset was taken by Headwall Hyperspec-VNIR-C imaging sensor over agricultural and urban areas in Chikusei, Ibaraki, Japan, on July 29, 2014 between the times 9:56 to 10:53 UTC+9. The central point of the scene is located at coordinates: 36.294946N, 140.008380E. The hyperspectral dataset has 128 bands in the spectral range from 363 nm to 1018 nm. The scene consists of 2517x2335 pixels and the ground sampling distance was 2.5 m. Ground truth of 19 classes was collected via a field survey and visual inspection using high-resolution color images obtained by Canon EOS 5D Mark II together with the hyperspectral data. The hyperspectral data and ground truth were made available to the scientific community in the ENVI and MATLAB formats at http://park.itc.u-tokyo.ac.jp/sal/hyperdata. More details of the experiment are presented in the technical report given below. The authors gratefully acknowledge Space Application Laboratory, Department of Advanced Interdisciplinary Studies, the University of Tokyo for providing the hyperspectral data. N. Yokoya and A. Iwasaki, "Airborne hyperspectral data over Chikusei," Space Appl. Lab., Univ. Tokyo, Japan, Tech. Rep. SAL-2016-05-27, May 2016. N. Yokoya, T. Yairi, and A. Iwasaki, "Coupled nonnegative matrix factorization unmixing for hyperspectral and multispectral data fusion," IEEE Trans. Geosci. Remote Sens., vol. 50, no. 2, pp. 528-537, 2012. N. Yokoya, N. Mayumi, and A. Iwasaki, "Cross-calibration for data fusion of EO-1/Hyperion and Terra/ASTER," IEEE J. Sel. Topics Appl. Earth Observ. Remote Sens., vol. 6, no. 2, pp. 419-426, 2013. N. Yokoya, T. Yairi, and A. Iwasaki, "Hyperspectral, multispectral, and panchromatic data fusion based on non-negative matrix factorization," Proc. WHISPERS, Lisbon, Portugal, Jun. 6-9, 2011. See the file LICENSE for copying conditions. 'Demo': a demo program of CNMF using synthetic data. 'CNMF': the CNMF source code. 'Quality_Indices': source codes for quality indices. 'Demo_CNMF': a demo program of CNMF using synthetic data. The MATLAB version was tested using MATLAB R2015b on Windows 7 machines. This Python version was tested using Python 2.7.5 on Windows 7/8 machines and Python 2.7.3 on a Mac OS X 10.9.5 machine. This program is free software: you can redistribute it and/or modify it under the terms of the GNU General Public License as published by the Free Software Foundation, version 3 of the License. You should have received a copy of the GNU General Public License along with this program. If not, see . Naoto Yokoya is with the Geoinformatics Unit, the RIKEN Center for Advanced Intelligence Project (AIP), RIKEN, Japan. Copyright 2019 Naoto YOKOYA All rights reserved.